If you’ve been scouring the web looking for information on lace front human hair wigs then you’ve come to the right place. There are so many types of lace wigs that it can be confusing to know the difference between a lace wig frontal and a lace front wig. Thankfully, we’ve got several pages of information for you to get up to speed with all things lace wigs. Much like our other pages on lace wigs, we’ll start with the basics and break up the term. 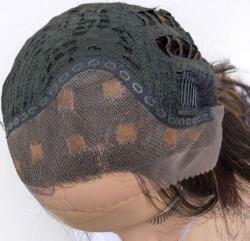 Lace front tells that the lace in the wig is located only at the front of the wig (you can read about what to do if you choose the wrong lace colour). The lace is either Swiss Lace (a thinner and slightly more fragile lace) or French Lace (which is slightly thicker and more durable than Swiss lace). The top (crown) and backof the wig will have a different cap construction such as wefts, or a stretch material. Human hair relates to the type of hair on the wig, so it’s a wig with human hair and not synthetic hair. The hair could come from a number of places including India, China, Malaysia or Russia to name just a few places and are either remy or non-remy. The few inches of lace at the front and sides, allows for the wearer to part the hair in any direction and maintain an undetectable natural hairline. This means that human hair wigs with lace located only at the front can be worn off the face in a ponytail without anyone realising it’s a wig. A lace front human hair wig is one of the least expensive of all human hair lace wigs. This is because of the shorter manufacturing process as the traditional wig ventilation process only takes place at a front and sides. However due to the fact that it’s made of human hair means that these wigs will generally cost more than their synthetic hair counter parts. Due to the traditional wig ventilation taking part at the front and sides, the price of a lace front wig with human hair is usually about £50 lower than its full lace wig counter part and if you’re new to wigs and really want human hair, this can be a more affordable option. Just like any other human hair wig, these lace front wigs will require treating as though the hair was growing out of your own head. Some call this lace wig care others call it lace wig maintenance, either way it equates to spending a little bit of time to make sure your lace wig remains in good condition and lasts as long as possible. There are two ways to wash your lace wig; a sink method that's great for straight and wavy lace wig hair textures and an upright washing method that is better for curly textures as it helps prevent tangling. Condition when necessary (either by leave in conditioners or deep conditioning twice a month), moisturise and limit the use of heat styling tools to preserve the life of your wig. The standard dark colours are usually readily available with lighter colours available as custom made lace wigs (design your own wig), however the growing trend is to include colours like blondes, reds and highlighted ranges as part of a ready-to-wear range. The colour range for wigs doesn't really tend to change (new colours are introduced, but the staples always remain) and so you’ll also be pleased to know that human hair wigs follow the traditional colour schemes with colours from 1 (jet black) to 613 (platinum blonde) and everything you can think of in between. Just how long will your human hair lace front last? That depends on how often the wig is worn along with how it’s treated. If you follow the basic guidelines of not overusing heat styling tools and always detangling from tip to root as seen in our human wig care guide then you can expect your wig to last a few months. Obviously if the wig is used less often it will last longer. However we know that you don't buy a lace front wig in order to never wear it and as we get a lot of questions about lace wig care, we put together a Q&A to help you love your lace wig. Lace front wigs with human hair are more affordable than a human hair full lace wig and are a great way to start your exploration into the world of human hair lace wigs and now available in versions that don't require lace wig adhesives which are known as "glueless" lace wigs (...yes...we know... it's not a real word) so that you can change your wig as often as you change your mind. The disadvantage of a lace front wig made with human hair is that due to the wefts at the back and sides it’s not as versatile as a full lace wig that you can part anywhere on the head. So there you have it, now you’re in the know about human hair lace front wigs.